Good! You have found us! You can stop searching now, relax and shop. 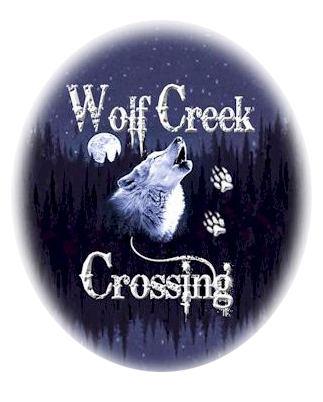 Wolf Creek Crossing is the store for you! If you are looking for a unique and outstanding gift for someone you love, for a friend or for yourself you have come to the right place. We have one of a kind art and jewelry pieces, sports items, belt buckles, money clips, wallets, military items and that is not all! We are your source for finding unique, wonderful gifts and collectibles. Add us to your FAVORITES FOLDER and come back often. We are always searching for new, unique and unusual products, and we will find that one special item that you are shopping for. If you see an item that you are interested in and have questions, please send us an email. Our mission is to provide quality merchandise to ALL of our customers at a great price. We hope that you will be satisfied and happy with your purchase. If not, PLEASE CONTACT US and we will do our best to resolve any concerns or problems. THANK YOU for shopping with us. If you have any questions or if we can be of any assistance, please email us. We are here to help make your shopping experience an enjoyable one.